Pumpkin is peeled and sliced. A batter is prepared with besan/ gram flour. 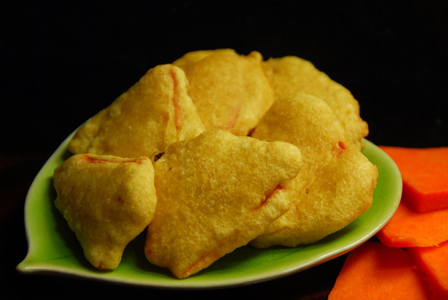 The pumpkin slices are dipped in besan batter and deep fried in oil till golden brown in color. Serve pumpkin fritters with steamed rice and ghee or as a snack. Makes: around 10 – 15 Pumpkin Fritters. Wash, peel and chop pumpkin into thick slices. In a mixing bowl, mix together gram flour, soda bi carb and salt with sufficient water to make somewhat thick batter. Dip each pumpkin slice in gram flour batter and carefully drop it in hot oil. Repeat the same with some more of the pumpkin slices until the surface of the frying pan is full. Fry the slices until golden brown on both sides. Remove the pumpkin fritters onto absorbent paper. Repeat the same with remaining pumpkin slices. Notes: Make sure to get the besan batter right. Suggestions: If the pumpkin fritters are hard, make sure the besan batter is not too thick. Add few drops of water to dilute the batter a little. The thicker the pumpkin slice, the more you need to cook them in oil. Variations: You can also add few pinches of red chili powder to the besan batter. Pumpkin is peeled and chopped and cooked in enough milk till the chopped pumpkin falls apart. Sugar is made into thick syrup and added to the cooked pumpkin. This is stirred and cooked till the pumpkin mixture loses most of the moisture and comes together. Makes: 2 Servings of Pumpkin Halwa. Wash, peel, remove seeds and chop pumpkin into small pieces. Crush green cardamom and remove the dark seeds. Crush the dark seeds into powder and keep aside. Heat ghee in a small pan on medium heat, add cashews and raisins. Fry till cashews turn light golden color and remove from heat. Grease a small dish with ghee and keep aside. Heat a sauce pot with quarter cup of water, add sugar and cardamom powder. Once the sugar syrup thickens ( one string consistency) a bit, remove from heat. Heat milk in a non stick pan, add pumpkin pieces and milk. Cook covered till pumpkin pieces turn soft and mushy. Stir occasionally and add more milk if required to cook the pumpkin. Leave on medium low flame till most of the milk has evaporated. Then carefully stir in the prepared sugar syrup, fried cashews, fried raisins, pumpkin seeds and cook on medium flame. Let the pumpkin and sugar mixture come together completely without sticking to the bottom of the pan. Once the pumpkin halwa becomes thick, transfer into the greased dish and press well to fit and flatten on top. When halwa is warm enough to handle, cut with a greased mould into desired shape and garnish with pumpkin seeds. Serve pumpkin halwa warm or cold. Notes:Make sure pumpkin pieces are cooked properly before adding the sugar syrup. Suggestions: If the end result of halwa doesn’t come together, then add few tbsps of sugar and let it caramelize and bind the halwa well. Variations:You can also add roasted slivered almonds if you wish. Other Names:Red Pumpkin Halwa, Kaddu Ka Halwa, Mathan Halwa. 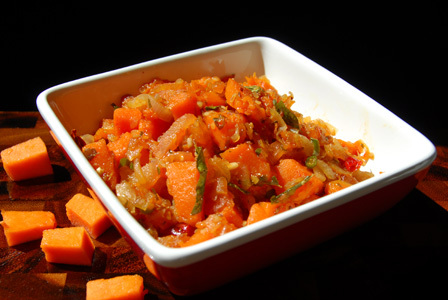 Pumpkin is chopped into small pieces and cooked in ghee tempered with cumin seeds and green chiles. Once cooked, pumpkin is lightly mashed with back of a spoon and cooled to room temperature. Plain yogurt is whisked till smooth and mashed pumpkin is stirred in. 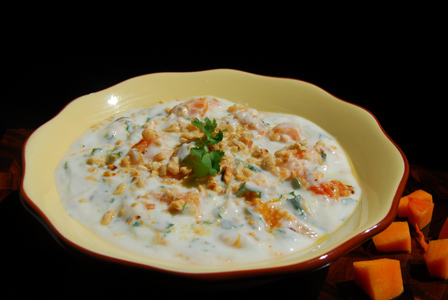 Pumpkin raita is finished with crushed roasted peanuts and finely chopped cilantro. Makes: 3 – 4 Servings of Pumpkin Raita. Wash, peel, halve, remove seeds and chop pumpkin to small pieces. Lightly crush the roasted peanuts. Thoroughly whisk yogurt in a deep bowl along with sugar and keep aside. Once they change color, add chopped pumpkin, green chiles and salt. Cook covered on medium flame till pumpkin turns soft. Add few tbsps of water to the pan if necessary and turn occasionally. Once pumpkin pieces start to fall apart, remove from heat. Lightly mash the cooked pumpkin pieces with back of a spoon. Cool the pumpkin mixture to room temperature and add to above yogurt bowl. Also add crushed peanuts and chopped cilantro to the yogurt bowl. Serve pumpkin raita chilled with spicy pulav or paratha. Notes:Make sure pumpkin pieces are cooked well before removing from heat. Suggestions: If pumpkin pieces are not cooked well, cook them covered on medium flame with few splashes of water till done. Alternatively, boil the pumpkin in few cups of water till soft. Variations: Sweet and Sour Pumpkin Stew, Pumpkin Coconut Curry. Other Names:Kaddu ka Raita, Red Pumpkin in Whisked Yogurt. 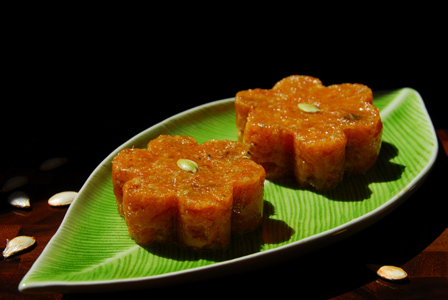 Pumpkin is cooked in water along with sour tamarind, sweet jaggery and red chili powder till little soft. Rice flour is mixed with little water into a smooth paste and stirred into the pumpkin stew to make it thicker. Oil is tempered with spices and added to the pumpkin stew as a final step. Wash thoroughly and chop pumpkin into large chunks. Pumpkin is generally not peeled for this recipe. Peel and chop onion into big chunks or thick slices. In a small bowl, mix rice flour with couple of tablespoons of water to make thick smooth paste. Heat a sauce pot on high flame, add red pumpkin chunks, tamarind extract, jaggery, sliced green chiles, fenugreek seeds and a cup or two of plain water. Bring the water to a heavy boil and reduce the flame to medium. Let the jaggery dissolve and let pumpkin pieces cook thoroughly while still holding their shape (around 20 min). Season with red chilli powder and salt and boil for few more minutes. Slowly stir in the prepared rice flour paste into the pumpkin stew to make it little thick. Add more rice flour paste if required but make sure the stew is not too thin or not too thick. Let the stew bubble for a minute before tempering. When mustard seeds almost stop spluttering, add this to the prepared pumpkin stew. 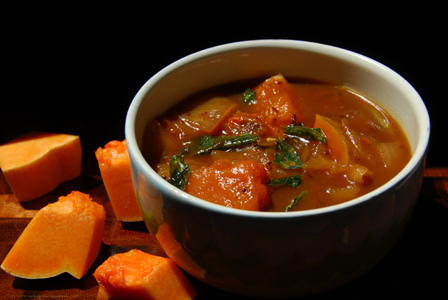 Stir well and serve pumpkin stew with plain steamed rice and dollop of ghee. Notes: Make sure pumpkin pieces are cooked to the point that they fall apart when lightly pressed. Suggestions: If the pumpkin stew is too sour, add more jaggery. If the pumpkin stew is too sweet, add more tamarind extract to balance the flavors. Other Names: Gummadikaya Pulusu Kura, Sweet and Sour Pumpkin Stew.